The July sales figures are not surprising given the expired meat scandal in China that the company faced in late July. On July 20, McDonald's and Yum! 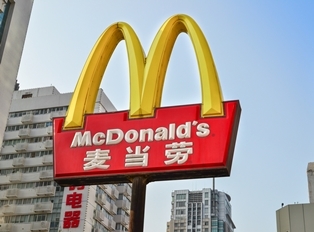 Brands Inc. (NYSE: YUM) both announced that they had ended a partnership with Chinese distributor Shanghai Husi Foods after news broke that the company had been selling expired meat and chicken to McDonald's and Yum locations in China. Following the incident, McDonald's officials warned investors that sales from stores open for at least a year would drop in the month. While global sales were down 2.5%, sales from the Asia/Pacific, Middle East, and Africa regions were down a combined 7.3% in July. Last month's incident followed a 2012 scandal in China that embroiled the two restaurant chains. At the time, officials discovered that MCD and YUM had been using chicken that was filled with excessive amounts of antibiotics. A second incident, just two years later, will undoubtedly impact any goodwill the company had regained following the 2012 scandal. Since mid-July, MCD shares have dropped more than 7%. In the last three months, MCD is down 9%. YUM shares have been hit even worse by the scandal, tumbling more than 15% since mid-July. In today's sales report, the company also indicated that U.S. sales dropped 3.2% in the month of July. Part of the problem has been a lack of customer traffic to its locations. McDonald's officials have even admitted that they seem to have lost relevance in the United States. Chief Executive Officer Don Thompson has previously told investors that it needs to repair its fundamentals, like staffing stores properly. There have also been discussions about simplifying its menu, after years of adding new items in the U.S. market.